AKG K92 review | What Hi-Fi? 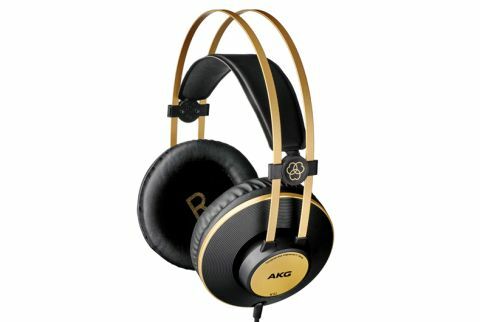 With plenty of Award-winning headphones in the bag, AKG has been on a roll for nearly half a decade now. So it really shouldn’t be a surprise that its 2016 line of affordable over-ear cans - which joins the affordable end of the K range of professional headphones - is pretty darn good. But thankfully AKG still has the capacity to surprise us. The baby of the line up, the AKG K52s, performed admirably for just £30. We might have been tempted to call them the best value headphones we’ve heard in recent years – but that was before we listened to the K92s. Sitting at the top of this three-strong range, the AKG K92s cost £50 – still affordable, but the jump up in sound quality is more than enough to justify spending the extra few quid. At first, the differences seem superficial. Unlike the all-black finish of the K52s and the middle-ground K72s, the K92s have gold accents that give them a pop of colour and distinguish themselves as the leaders of the line-up. It’s not a blingy gold, but a subtle, almost champagne-like gold. Apart from that difference in finish, the K92s look pretty much the same as the K52s. The headphones are built well (especially for a £50 pair), and the frame feels sturdy and durable. The self-adjusting band is springy and settles around your head comfortably. Some might want manual adjustment, but we found the K92s had the right fit and clamped down just enough around our heads to stay firmly in place. The large over-ear cups are airy and comfortable, too. The leatherette padding keep our ears cushioned without getting hot over long hours of listening. The 3m long cable is thick enough not to tangle. It ends in a 3.5mm plug, but also comes with a 6.3mm adapter so you can listen to your hi-fi system in peace. There are no in-line controls or features such as you’d find on the more portable Y50s, but as the K92s are designed for home use, so there’s no need for a remote to control music playback. We listen to Dave Grohl’s Sound City album of famous musicians singing together, and the recording has ample space to flourish. Whether you’re listening to Stevie Nicks, Paul McCartney or Trent Reznor, the K92s are detailed and clear enough to show off the different styles of each artist. The slow build up in From Can to Can’t is tense and brooding, with the K92s showing off a composed and mature sense of timing. The drums hit with a good amount of snap, and you can hear the layers of distortions on the guitars. The K92s have a great handle on rhythm, with all instruments working cohesively and in time with each other. Voices are solid and nuanced. Corey Taylor’s earnest singing comes through clearly. You can hear that he’s holding back from his signature Slipknot roars at the beginning of the song, and then unleashes as the song carries on and hits the second chorus. The cans are surprisingly revealing and dynamically fluid for their price. The peerless John Williams proves he still has his magic touch with Rey’s Theme – a delicate, gentle melody that’s full of enthusiasm and promise for the young Star Wars heroine. The dips and soars are handled elegantly by the AKGs. The strings have tension and detail, the horns don’t sound harsh or bright, and the drums don’t boom. It’s a smooth, enjoyable sound. The K92s are a clear step (or two) above the K52s: they’re more revealing and articulate, and give you notably better dynamics and rhythmic accuracy for just £20 more. If you’re thinking of spending £50 on a decent pair of headphones, you might already be looking at the AKG Y50s – they’re portable, foldable and you can pause and skip tracks with them. But if you’re mostly going to be listening to your music at home, and just want a great-sounding, comfortable pair of cans to hook up to your laptop or hi-fi, then the K92s will suit you perfectly.